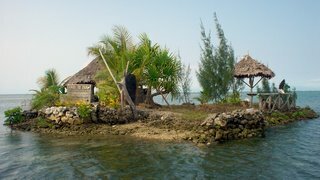 We spent only a few days in Luganville to buy fuel and supplies and then set off south down the leeward (west) coast of Malekula. We found we could sail half the time and motored the rest as we traveled SSE down the coast. 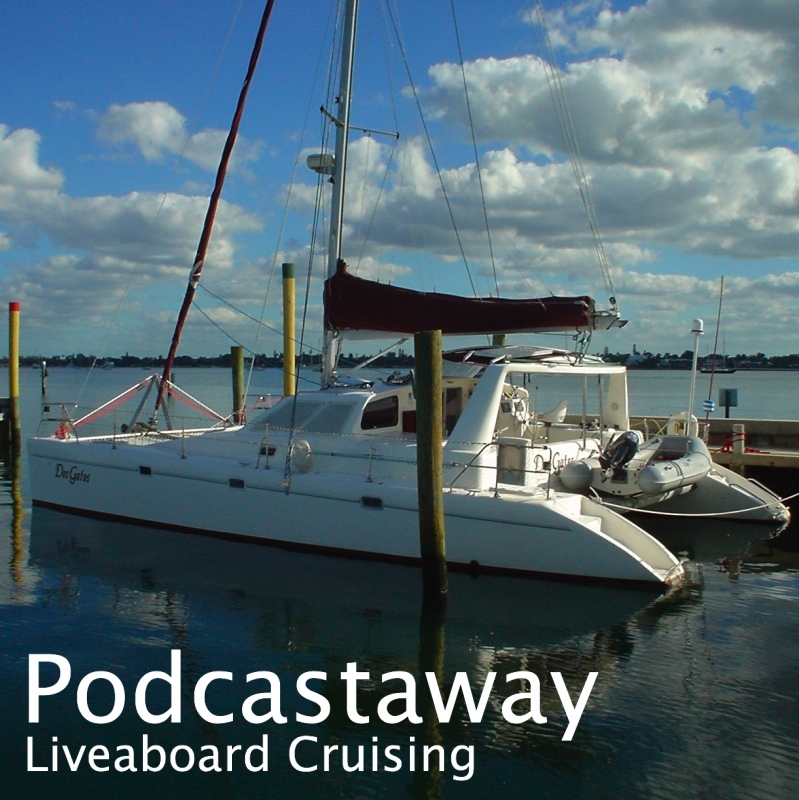 We made an overnight stop at Malua Bay and then a two night stop at Southwest Bay. We stopped there to dive the reef. The locals charged us 300 Vatu each ($3) for the privilege - the first time we've been charged for diving on a reef. The reef is extensive - stretching about a mile north from the west point of the bay. We went through a small boat channel and dived on the outside. Next we went on to the Maskelyne Islands at the southeast point of Malekula. This group of small islands has several small islands, several good anchorages, and lots of reef. We stayed three nights and made two dives in one of the channels - tidal currents were a problem. We also paid some locals to take us to a giant clam reserve where we snorkeled over their collect of ~500 large giant clams. Now we've taken advantage of a quiet day to motor east to Epi in search of the elusive dugong! We spent a couple of days here two months ago but only had brief sights of a dugong - we've come back for a second try. We've been in Waterfall Bay on Vanualava in the Banks Islands for a week attending the Vanualava Cultural Festival. This 6 day festival is an exhibition and celebration of Custom (i.e. Traditional) skills and activities. There were 5 other boats at the festival, a rather disappointing attendance for the organizers. But there were hundreds of locals come from all over the island. The rest of the week followed a pattern. We were in the village from 8:30am to around 5pm with a break of a couple of hours for lunch, in which some yachties returned to their boats while others bought lunch in the village. They were well organized with a group of English-speaking locals wearing badges saying "Tour Guide" who were our minders. There were others labeled "Security" who carried our dinghies up and down the beach. There was an "MC" with a loud-hailer ("you me clap clap one time"). We were herded (politely) from activity to activity. The day started and ended with a Custom Dance. 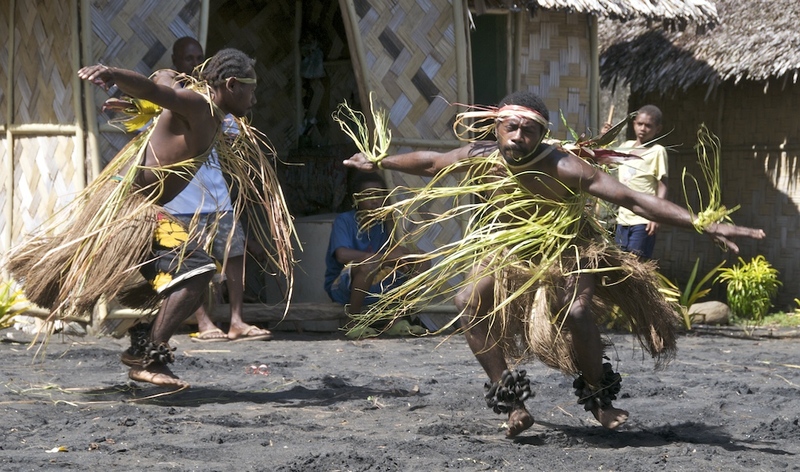 These were performed by men dressed in grass skirts and in some cases headdress. They danced to drums and some had rattles of nut shells tied to their ankles. All the dances were different. Then there the String Bands. These bands apparently originated when Vanuatu people heard US GIs playing Bluegrass in WWII, when Vanuatu was a major base of the War in the Pacific. They comprise three or four guitars, a ukulele and a string bass made from a tea chest. Between the dancing and music we had demonstrations of Custom skills. They constructed and launched a dugout canoe in three days. They built a small traditional house. They showed us how to make shell money. They enacted traditional marriage and adoption ceremonies. They made fire with a stick and cooked taro in a pit full of rocks. On the last day there was the closing ceremony (with another unfortunate pig casualty) and the yachties put on their own musical entertainment. Unfortunately, I've been sick for a couple of days so missed my big chance to play my part in "Row, row, row your boat". Overall, the festival has been worthwhile. We've got closer to locals than anywhere else and we've seen a lot of their traditional culture. The days were long, hot and tiring, though. 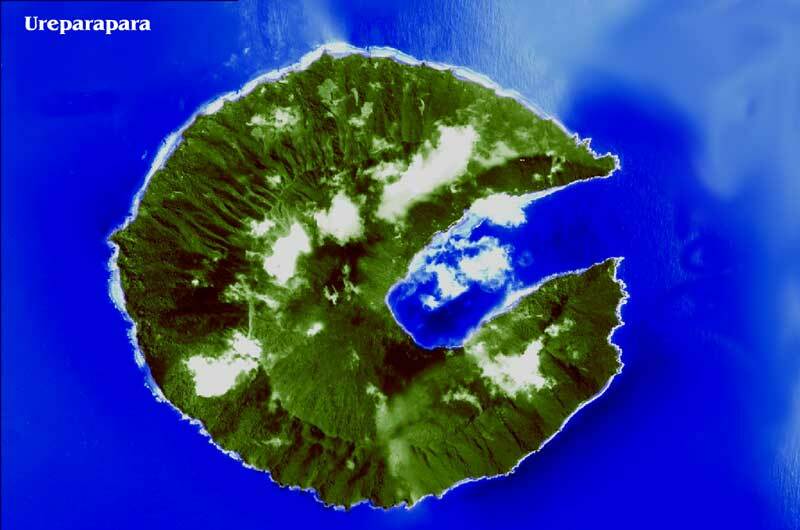 After a week at the reef islands we sailed 10 miles to Ureparapara. Leaving the atoll was no problem as we left at high tide early in the morning, and the wind was lighter than when we arrived. Ureparapara is a dead volcano. It is round with its center occupied by a large crater. What makes it different is that the northeast side of the volcano blew out long ago leaving long narrow Lorup Bay extending into the crater. From above it looks just like Pacman in the old video game. We anchored at the southwest end of Lorup Bay with a second anchor holding us stern in towards the coral on the shore. The wind barrels in from all directions due to the high walls around us, but swell and chop comes down the narrow bay. The volcano wasn't considerate enough to blow out on the leeward side! Despite this perilous anchorage, the holding is good and we were comfortable for three days. Shortly after arriving we learned that an old man in the village had just died, so our first task was to help the chief use our satellite phone to contact the man's son who lives in Sola on Vanualava - about 15 miles away. We were successful and the son arrived in a Police boat a few hours later. The coral inside Lorup Bay is in very good condition. Presumably, inside the bay it is more sheltered and thus less beat up by storms than that at the Reef Islands. We snorkeled and made two dives. Now we have left and come back to Waterfall Bay on Vanualava which is the site of the 2008 Vanualava Cultural Festival next week.